It is an artist goal to create something that is lasting, a work that will stand the test of time, a work as relevant in fifty years as it is now. Lydia Johnson has done this with Summer House. Premiered in 2011, it is a quartet that is separated into six sections and set to the Excerpts of Philip Glass: Etudes for Piano, Songs and Poems for Solo Cello and String Quartet No. 5. 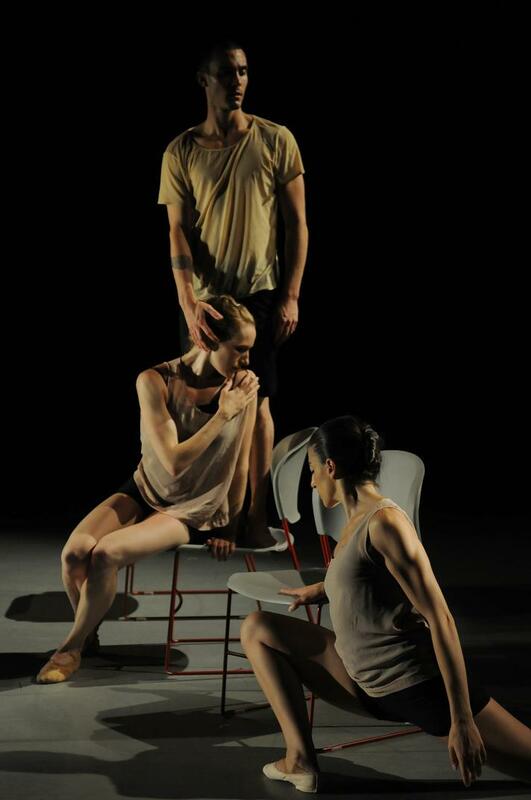 The four dancers are Laura DiOrio, Lisa Iannacito, Jessica Sand and Reed Luplau. Drawn from the collected memories of four individuals that spent a summer together in a house on the beach, Summer House is a tale of divided loyalty and the turmoil that the heart can put us through in its unrelenting testing of integrity. The first section is simply beautiful. Laura DiOrio is seated and looking back at Reed Luplau, he stands and meets her and they begin a duet, their movements fluid and full. There is a story here, and immediately you are pulled in. Ms. DiOrio and Mr. Luplau express a mutual sense of care and longing for each other, a sense of connectivity. There is something celebratory and slightly sensual in their movements. But even with this said, there still is an inner conflict that Mr. Luplau is experiencing. He is man with a troubled conscious, a man irreversibly drawn to two women who he knows are closely bound by ties unseen. He is drawn to Ms. Sand and she is drawn to him. Ms. Johnson uses chairs to represent places of safety, places of retreat, a place to go when in need of solace or to recollect, and a place that gives both comfort and privacy. The dancers leave and return to these places, venturing forth only to retreat back, much like the waves on a beach. In this piece you get a sense that the relationship between the three women is complex and long-established, perhaps they are sisters, cousins or childhood friends. But there lay a bond that is deeply emotional. In the second section Ms. Sand is found lying beside Mr. Luplau’s chair, perhaps after a night of passion. Mr. Luplau gazes into the distance with a look of despair, a look of questioning. He raises his arms, pulls it back and cradles his head, twist his body away from Ms. Sand’s prostrate form, lamenting his decision or questioning his sureness. They engage in a short duet of guilt and longing blended with the physical craving for each other. Mr. Luplau reaches to Ms. Sand then turns away, looking back at Ms. DiOrio, uncertainty on his face. In the third section the three women are seated together with Mr. Luplau seated downstage alone, his back to them. Ms.DiOrio has her face turned away from the other two, Lisa Iannacito, who is seated in the middle has Ms. Sand’s head cradled on her shoulder, lovingly. The three move with purpose, blending and mirroring each other’s movements. Ms. Iannacito must work as both comforter and mediator; she is the middle sibling who settles disputes and creates harmony between the other two. She is the one who always understands and never judges. She is aware of the unspoken conflict between Ms. DiOrio and Ms. Sand. The kenetic conversation between the three women is of anguish and denial, a non-resolved reasoning of reality. Ms. Iannacito attempts to bring understanding between the other two, to establish a common ground. But in the end Ms. DiOrio turns away from the others and as the lights dim Ms. Sand reaches for Ms. Iannacito and pulls her gently to her, but is it for comfort or an attempted alliance. Section four finds the three women separate from one another and seated in a spaced diagonal, facing the same direction. Ms. Sand is farther upstage and she is kept in darkness during this section. Mr. Luplau is kneeling by his chair looking at them, the uncertainty of his decision evident. Holding his head in both hands he bends over in anguish. Ms. DiOrio and Ms. Iannacito mirror his movements, sharing in his feelings that each is aware of, but no-one wants to acknowledge. Mr. Luplau seems to have a decision that must be made but he does not want to make it. The movements in this section are constrained, close to the chair as if in constant need of safety. Mr. Luplau only steps away from the chair briefly and then quickly restores contact. The women seem even more reluctant to leave the comfort and security the chairs have to offer. In fifth section Mr. Luplau and Ms. DiOrio have established a sense of purpose, a sense of unity and emotion. One is always aware of what the other is feeling, their movements blended with affection and concern. They sit in the same chair together, both knowing something needs to be said but neither wanting to start. There is tenderness here, moments of intimacy and shared concern. In the last section the four are forced to confront each other, Mr. Luplau and Ms.DiOrio on one side and Ms. Sand and Ms. Iannacito on the other. It is like an awkward family gathering, no one wants to be there but everyone must. Ms. Sand seems unable to look Mr. Luplau in the eye, her gaze directed away from him. It is Ms. Iannacito that moves freely here, she is unencumbered with guilt or conflict. Mr. Sand and Mr. Luplau reach for each other, he lifts her and they move together. He is as drawn to her as she is to him. Mr. Luplau sits beside her, but still he is infused with guilt and cannot look towards her. Ms. Sand stands and looks into the distance; Ms. Iannacito reaches to console her and encourages her to return to the security of what she knows. When Ms. DiOrio reaches for Mr. Luplau he readily answers her, meeting her as she stands. He cradles her and entreats her to return to the familiarity of the three and not to allow him to divide something that was once so strong. Summer House is a bit Chekhov, Emily Dickson and Brontë rolled all together. It will take you on an emotional journey of passion and betrayal. It is the story of how the heart can sometimes be divided and how emotions can twist our principles. 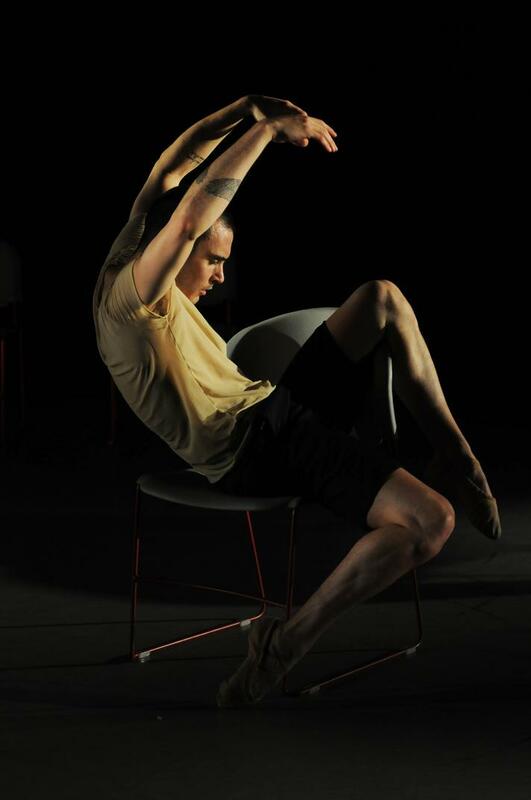 Reed Luplau, who also dances for Lar Lubovitch Dance Company, was stunning; he has such expressive musicality and portrayed a deep emotional connection to the work, when he moved you moved with him, swept-up in his passion. Ms. DiOrio and Ms. Sand told a subtle tale of anxious uncertainty with great emotion. Ms. Iannacito was brilliant as the middle go between; the one how never judged nor stop caring. Summer House is a brilliant work. A work I believe will stand the test of time. My only complaint and really it’s more of a suggestion is to get better chairs, something that truly works for the piece. The auditorium style chairs took away instead of adding to the dance. « Join Bolero, Red Bank’s Own Flash Mob: All ages are invited to join this large-scale flash mob. No dancing skill required.